Our journey with Trisomy 18 to meet our daughter Mylah Roberta.... Mylah was born Saturday, March 24, 2012 at 5:11 am weighing 5lbs 3 oz. We are praising GOD for her Life! 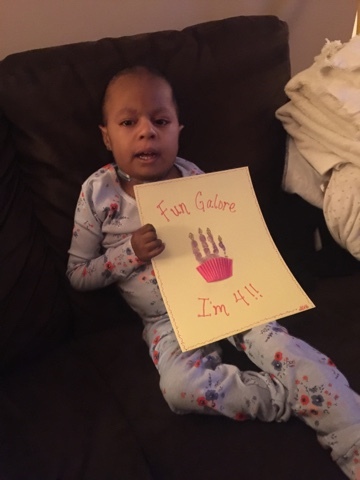 This blog will continue to chronicle Mylah's Journey with Trisomy 18 as she continues to defy odds with each breath she breathes! This is a continuation of "In The Blink Of An Eye"
As I rode in the front of this sky blue ambulance, I cried. The tears fell continously. How did I go from trying to find the right shoes, the perfect shirt, the best shade of aqua trying to coordinate her Easter outfit about 4 hours prior, to riding in the front of an ambulance praying for the life of my child? My legs were cramped under her portable suction machine and her diaper bag; both filled with extra supplies that the hospital may have needed. We pulled up to the hospital and I could see my family waiting for our arrival. They greeted us like a medical team ready for action. I hopped out and moved to the side. I felt the stare, that awkward feeling you get when you feel someone is looking at you. A great big panda bear with a smile gazed at me. We locked eyes, his smile met my frown. Panda One, the ambulance for kids. This panda is supposed to be soothing I suppose, but I'm aching. Hurting because on the inside of this ambulance that is adorned with this large smiling Panda is my child and this was not a situation that warranted a smile. Mylah emerged from the ambulance, strapped to the gurney and she was briskly wheeled into the hospital emergency doors, up the elevator, 4th floor, ICU. We were welcomed by a team of nurses, who were waiting on her arrival. They moved quickly about the room. Nurses, Respiratory Therapists, more nurses. They moved rapidly. The transfer was complete. We settled into the room, unsure how long this stay would be. Hopefully short, but I began to mentally prepare for hospital living again. As I sat there hoping, praying for my child I saw her. A face that looked so familiar. I couldn't be sure it was her. Memories began to play in my head. I went back, back to where we started. Back to where this journey began. I stared at her from across the room and tried to convince myself that it wasn't her, but I knew it was. I never forget a face, and I could never forget the face of someone who touched my life in such a profound way. She walked in and out the room a few times, before I gathered up the courage to attempt to confirm what I suspected. "Excuse me, did you use to work at (insert name of my birthing hospital)?" "Yes" she replied as her eyes gave me a confused look. My arm extended towards Mylah, as she lie in the hospital bed. "You gave her a bath when she was born"
Her eyes now wide open, her mouth formed a look of shock. She darted to Mylah's bedside and grabbed her small foot, she looked at the finely printed name on the tag around her ankle. "Oh my goodness, It's her!" she yelled, almost as if she quickly forgot we were in the ICU. I blogged in the days after Mylah's birth and about my experience. Specifically regarding the nurse who bathed Mylah, and afterwards who expressed that it was a honor to participate in her life. That encounter though brief, left a mark on my world. I always wondered what happened to all of the nurses who participated in Mylah's birth specifically the one who bathed her. I later found out her name was Lori, but had no way of contacting her about how much her words impacted me that day. After she expressed such thoughtful words to me I never saw her again; until now. She told me that she wondered about us since Mylah's birth and always wanted to know how Mylah was doing. She remembered that I created the blog, but couldn't find it because she was unsure about the spelling of Mylah's name. She contacted her old coworkers, but none could provide her with the information she needed. Who knew a seizure would bring us back together. In that moment, at a time when my heart was so sad for Mylah's current condition, it was also happy. I would get the opportunity to tell Lori how much I appreciated what she did and said that day. I wanted her to know that I never forgot her expression of gratitude. There were many things that happened that day and some of the memories I wanted to file in the archive section of my brain, but every now & then her words would play back in my mind and bring a smile to my face. As I expressed my gratitude that I held for over 2 years, my tears began to fall from and I could see her emotions gather in the wells of her eyes. She remembered everything. The negativity, doubt, the judgement. "She is the reason I left" she said. "Remember the doctors said she wasn't supposed to live, she wasn't gonna make it" It was a statement she definitely didn't have to remind me about. I had heard it from the beginning. It was just nice to know that not every person in that room on March 24, 2012 felt the same way as those doctors. I was glad that she was able to see that she deserved to be elsewhere. She was happy to know that Mylah had been doing so well up unto that present moment. We embraced and she walked out and she took with her the happiness that had distracted me for the moment. Now I was forced back into the present to deal with the issue at hand. Trying to figure out what was wrong with my daughter. Why suddenly had things gone so wrong? I couldn't be too sure, but Mylah was as stable as she could be for the moment. Intermittent seizures ran through her body, just like the ones she had before, not like the one that brought us here. I rested in a chair on the other side of her room and watched as they placed her on a ventilator, just like the ventilator that was scheduled to be picked up from our home on the upcoming Tuesday. She had made so much progress, we couldn't go back to where we had come from. I hoped that we wouldn't be there for long. Just wanted to let you know Mylah and your family are in my thoughts! how are you and mylah doing? I've been worried about you, please share an update when you have time.